A Frenchman who found a photograph of a Pembrokeshire soldier killed in action during World War One wants to trace his family to pay tribute to him. Pte Henry Davies, of St Nicholas, near Castlemorris, served with the South Wales Borderers but died of his wounds on 4 November 1918. 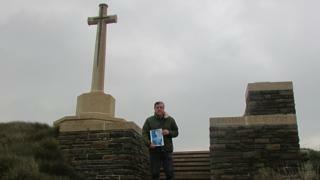 Louis Sabos, from Sommaing, Northern France, discovered his photo near Canonne Farm British Cemetery. He wants to find his family to "honour him". Pte Davies lived in St Nicholas and his name appears on the village war memorial. After finding the picture, Mr Sabos contacted Pembrokeshire Archives and Local Studies in Haverfordwest, which cares for the county's written culture, history and heritage, to ask for help contacting Pte Davies' family. "He was 21 years of age. It will be a century since his death next year and I would like to find any of his family still living in Pembrokeshire so we can honour his memory," he said. Records show that before the war, Pte Davies, who was the youngest son of James and Anne Davies, of Spring Garden, St Nicholas, worked at Caersegan Farm and was a faithful member of Llangloffan Baptist Church. Pte Davies' brother, George Mathias Davies, was awarded the Military Medal and died in St Nicholas in 1964. Archives assistant Helen Evans urged anyone with information about Pte Davies, or anyone who would like to contact Mr Sabos, to contact the centre. "It is wonderful that Mr Sabos wants to pay tribute to a soldier from our county and make contact with his family," she added.